dressed up like a lady: Happy V-Day! 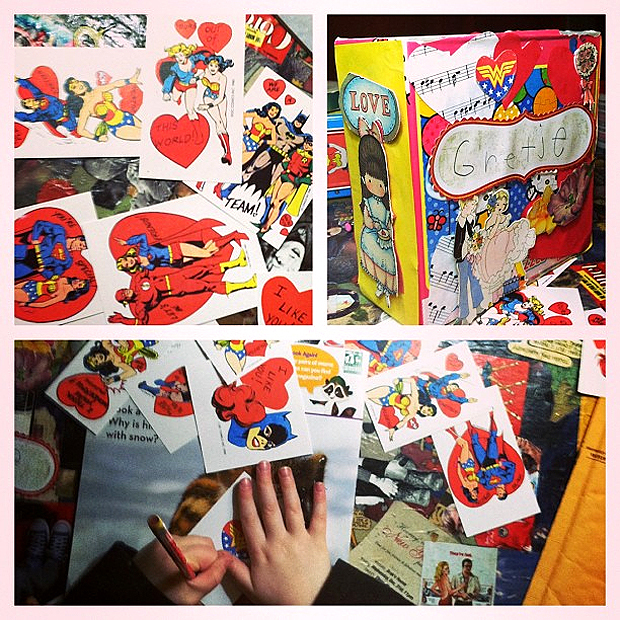 Gbear really, really wanted Superfriends Valentines to pass out at her kindergarten class party. This is what we get for showing her old cartoons that they don't make merch for anymore. 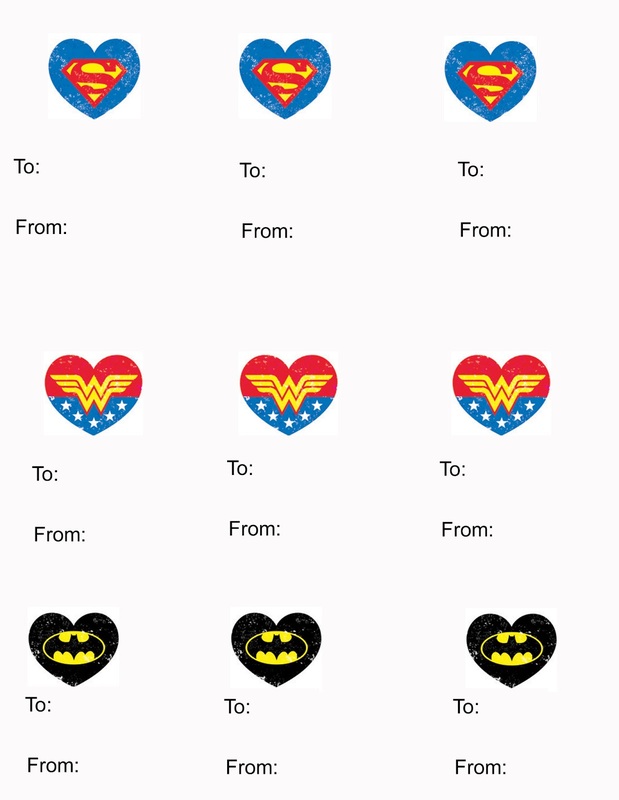 I poked around the internet and found some Valentine designs featuring old school renderings of Wonder Woman, Batman, Superman, Supergirl, Batgirl, and The Flash. I arranged the designs I knew she'd love more or less along a grid in Illustrator, made a backside that mostly lined up to the same grid for the "To" and "From" using some superhero logo heart cutouts, and that was it. 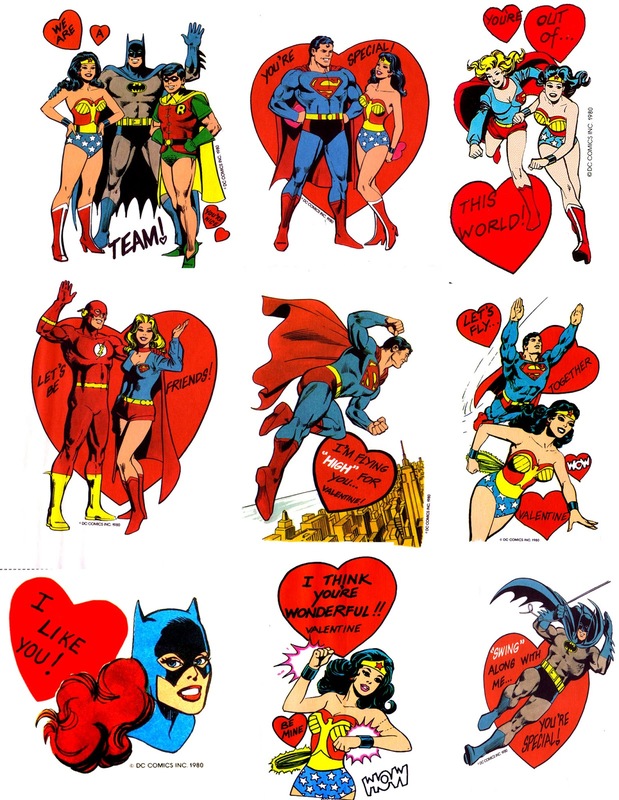 Want to make your own DiY Superhero Valentines? DC Copyright be damned, I'm posting the images for you! Click "Read More" to see them -- the images are pretty big so they'll print with decent resolution. I loaded my printer with card stock, but you don't have to bother if sturdiness isn't important to you. Just click "scale to fit media" in your printer configurations, and then figure out how your printer configures to print front-to-back (or figure out which side it prints on so you can reload the same sheet of paper to print the front, then the back), then cut them out! I used a big paper cutter, but I can't cut in a straight line to save my life. OMG I love it! I like the way super heroes were drawn in the old days much better than how the are now. Justice League looks so crappy compared to this. I love these! I need to print this out and distribute them throughout the year! When are superheroes and declarations of like and love NOT in season? SO NEAT!